As of this writing, I have been totally sugar/fructose free for about 2 weeks now and Hubby has been for over a month. I have to say I feel better, AND everything tastes sweeter. It’s like with the sugar/fructose in your system you can’t really taste the real flavors in anything. Everything tastes so much better. So, Hubby and I coupon and we stock up when things are on sale for a great deal. Well, just before we decided to go sugar/fructose free, there was a deal on sugar…. so, I now have about 20 5lb bags of sugar and we don’t eat it anymore! lol So, I researched ways to use sugar that don’t include eating it, and I found there are quite a few ways I can use it. Now, I will say most of it will go to family, friends, and the shelter in our area. 10 Other Uses For Sugar! Other than eating of course :). Make a thick paste of sugar and small amount of water and apply to the stain, let sit for 30 minutes to an hour and then wash normally. Whatever chopper you use you can use sugar to keep the blades from getting dull while cleaning them, too. Grind 1/2 cup or so of sugar for 4-5 minutes and you’ll have a nice clean smelling chopper with sharp blades! Works for coffee grinders, too. Mix any kind of vinegar with sugar to make a sweet and sour scent then mix just a squirt of dish soap and mix well. The sweet and sour scent attracts them and when they consume the liquid the dish soap kills them. You need the sweet and sour scent to mask the dish soap scent. You can (if you are not sugar/fructose free) use a teaspoon of sugar or a cube of sugar to soothe a burnt tongue. Whether it’s from spicy foods or you actually burned it with a hot liquid, this trick should instantly relieve the pain. You can make a very frugal yet effective body scrub by mashing a very ripe banana and adding 1 tsp of olive oil with 3 TBSP sugar, mix well and use in the shower to exfoliate and moisturize your skin. You can add a couple of cubes of sugar to airtight containers with your cookies, cakes, or cheese and extend their freshness by up to a week! To keep fresh flowers lasting longer add 3 TBSP sugar with 1 tsp vinegar to your water in the vase, mix well to keep your flowers looking great longer. The sugar feeds them and the vinegar fights bacteria in the water. I have used Lava hand soap for greasy messes after working on a car or bike chain. Yes, I have helped . But, you can use sugar and have a very frugal cleaner and it smells better. Just sprinkle sugar in your hands, add a little soap and scrub the grease right off! We had an infestation of German Roaches for a few years that we could not get rid of, a family member asked us to store a stove in our garage and apparently it was infested an we didn’t know. The exterminators said that German Roaches love electricity because it tastes sweet. That’s why you will see them in electronic resell places and pawn shops. We bombed, we sprayed, we spent over $500 with exterminators and nothing worked! Finally I made a paste with peanut butter, sugar, and baking soda, equal parts. I put a tsp full in baggies, leaving them open I set them around the house in drawers and cabinets and in less than a week they were ALL gone! The baking soda kills them, but the peanut butter and sugar draw them. I have not tried this one but, I know people who swear by it! Swallow a teaspoon of dry sugar without water, and your hiccups disappear! 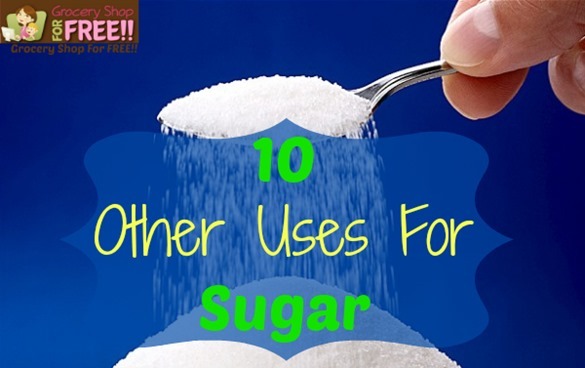 So, there you have it 10 Uses For Sugar Other Than Eating. Do you know of any others?